Diego Costa's equaliser wasn't enough to claw a draw, as Liverpool departed London in sheer elation and maximum points to deny Antonio Conte's side going top of the table. A 17th minute opener from Dejan Lovren followed by Jordan Henderson's sublime strike from long-range doubled The Reds' lead in a one-sided half that proved to be the difference. Jurgen Klopp's side shaded the opening fifteen minutes - an accumulation of economical, effective interchanges between Clyne, Mane and through to Coutinho was use of effective possession and tactical dominance. The hosts, stranded with little room to manoeuvre, engaged in a battle to withstand Liverpool's early penetration. Thibaut Courtois fumbled Coutinho's effort away, the only clear-cut chance, while Hazard and Costa valiantly but unsuccessfully tried to claw their team back into an attack. Needless to say, it lasted seconds before The Reds capitalised on Luiz, Cahill's defensive frailties as Dejan Lovren, unmarked through a line of blue/red shirts, met Coutinho's pinpoint cross and effortlessly slotted past Thibaut Courtois in the far corner to take the lead at Stamford Bridge. Fully deserved, too. A sense of confidence, satisfaction of Klopp's philosophy oozed through their veins and it was evident on the pitch. Antonio Conte's men were being outplayed, but even worse, had zero defensive instincts or intelligence to leave four unmarked red shirts in the build-up to the opener. Diego Costa was frozen out, as was Eden Hazard. With no key to unlock the door and flex their talent, N'Golo Kante resorted to a long-range effort to at least test Simon Mignolet, however failed as sighs of frustration crept around the stadium. Daniel Sturridge looked a menaced, and, in no real surprise, presented David Luiz's sternest test in 30 minutes than he faced in a whole season of Ligue 1 competition. Still, you'd be inclined to believe would spark a fire, but it did no such thing for the home side. No signs of urgency or ideas came back to bite them hard, as Jordan Henderson spectacularly doubled his side's lead from 25-yards out. In a delightful strike, he didn't hesitate in pulling the trigger and with no markers around, did so with a force that left Thibaut Courtois absolutely helpless. Chelsea had lacked creativity in midfield, with N'Golo Kante perhaps highlighting his best assets aren't in a team that thrive on possession rather than defending and breaking up play. The new signing provided little to zero offense, neither did Nemanja Matic. Contrasting to the first half, Conte's men rallied hard in the second. There were signs of creativity, especially from Hazard and Oscar, and the visitors were finally being forced to defend for the first consistent period of time. In a spell of weak defending, Diego Costa capitalised and clawed his team back into contention. The lack of instinct from Henderson or Matip allowed Hazard to feed Matic through to the left byline, who dismissed one sliding challenge, chipped to Costa in the middle where The Spaniard tapped home from close range. 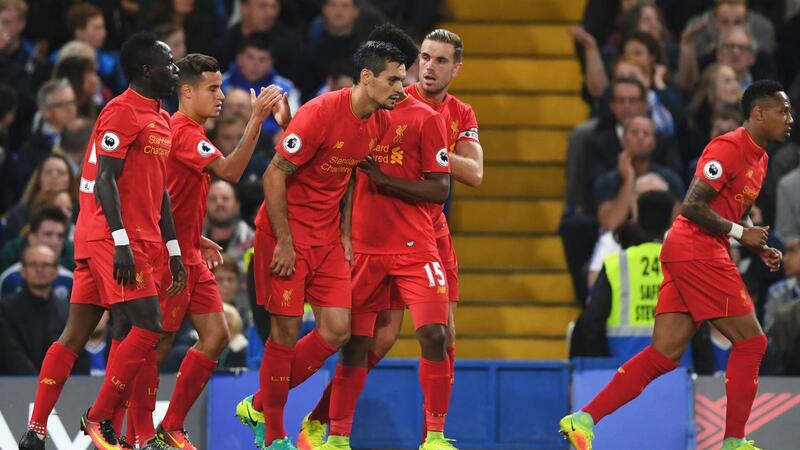 It was a vastly improved effort from Chelsea in the second half, and, all of a sudden, Klopp's side looked nervy at the back as the attacking starlets began to go to work. Doing so, they were still unable Liverpool enjoyed a late spell with two chances falling to Philippe Coutinho, but the first he couldn't latch onto a header and the second an unsuccessfully attempt at catching out Courtois from the edge of the box. Moments later, Divock Origi's golden opportunity at adding a third was tremendously denied by Courtois once again, as he got down low to shield his body in front of the power header. The hosts pressed late on, but it was too little too late. Liverpool were defending for their lives, but despite their frailties at the death of games they were once winning with ease, Simon Mignolet's goal was rarely troubled. The closest chance was a close-range free-kick, but somehow that was fluffed and left Chelsea fans wondering why David Luiz wasn't allowed smash it and hope for the best. As frustration roomed around Stamford Bridge, the smaller but more vocal away stand erupted in elation as Liverpool recorded their second big away win of the season. Visits to London are suddenly becoming enjoyable for The Reds, aren't they?